Decluttering your home time to time is an important thing to do. This will serve many purpose like it will get your home cleaned, things are sorted out, zero wastage around home, sense of satisfaction, things are organized properly and many more. 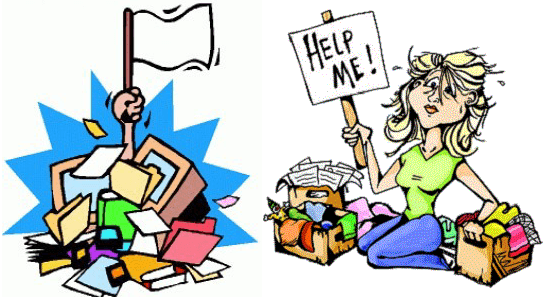 Generally, clutter is the outcome of indecisiveness, lazy habits or improper time management. Every day, we keep on searching for missing things and we waste our time. Clutters causes stress. Irrespective of how much stuff we have, decluttering will bring more positivity to self as well as to our home too. You would be in a big confusion as to where to start and when to start and how to manage such a big pile of mess. Yes, it’s the Time to declutter! There are various techniques to declutter. Let’s explore these and implement which you find easy to start with. This is the most famous method of all and its popularity is increasing day by day. This method is by Marie Kondo, an organizing consultant and also she wrote a book on the same called The Life-Changing Magic of Tidying Up: The Japanese Art of Decluttering and Organizing. Her method is based on the emotional attachment we have towards our belongings. Her only question for organizing and decluttering any belonging is – Does it bring joy to you? If the answer is in yes then you get to keep that particular item, if no or is in kind of doubt then you should either donate or get rid of it. 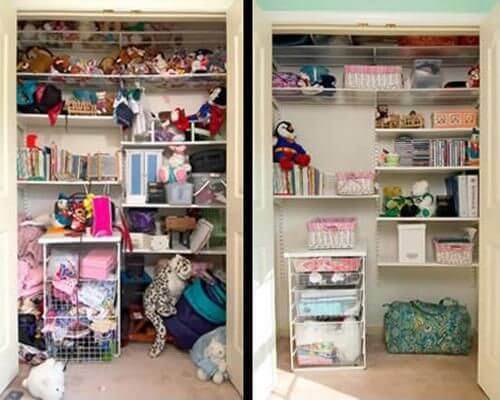 For this, first you have to go through each and every item in your room or area which you chose to declutter. Pick each item and ask the question, does it spark joy? If yes, keep it and if no or in doubt, donate or discard it. Sort and eliminate by particular category by category. Don’t go by rooms rather go by each category like clothes, books, cutleries, shoes, and so on. The reason being that items in one category may be scattered throughout the home. After doing so, organize each item to a specific area so that each item has its own place. She also insists on creating sections in the drawers by placing an opened box or dividers in it to categorize and give similar items its place. 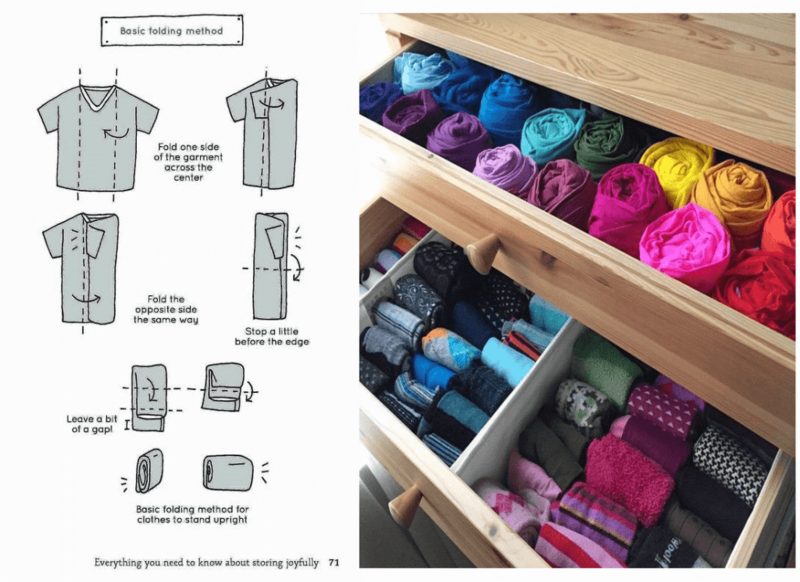 Marie Kondo also shows the technique to fold the clothes and also to place them in dressers or drawers. Instead of stacking clothes in heaps, the KonMari Method insists folding them into a rectangle shape so that the clothes can stand up. This will serve us the purpose of seeing everything in our drawer at a glance. Another simplest decluttering method is the Four Box Method. To implement this method, one has to keep four boxes and name those three as Keep, Donate/Sell, Storage and Trash. Take each item and think where it needs to go and put it in the respective boxes. Here firm decision needs to be made and no personal attachment to be kept or you will end up keeping all your belongings in one box. Keep boxes will include items you need or which you use regularly. Donate or Sell box is for all the items which you don’t need and is in good condition and can benefit other. Trash Box contains items that you don’t need any more nor can anyone benefit from it. These are all the damaged goods. Storage boxes items are those that you can’t part with or not a daily life usage item. They’re to be stored for later use. But be very careful to not fill this box up. 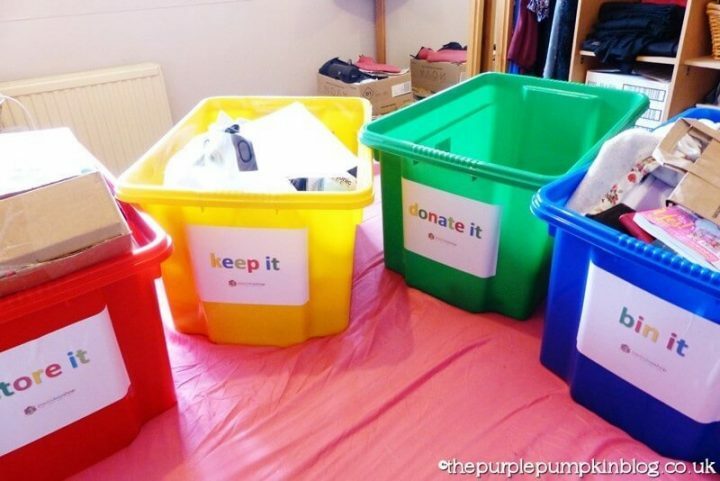 As you are done with it, empty the boxes to its specific places, donate or sell boxes should be emptied immediately by either donating it or selling it. Trash box items to be thrown instantly to avoid any second thought. 1st pass: Donations and Trash – Here you need to concentrate on the things that are either need to be donated or thrown away. Don’t let it in the home for long. Empty these as soon as possible. You would feel much better. 2nd pass: Keep or Storage – In this pass, you have to decide whether a particular item is needed on a daily basis or you want to store it and keep it boxed up. The storage items need to be boxed and kept in racks where you won’t go through on a frequent basis. Keep a label on it. 3rd pass: Sorting it up by Rooms – Now all you are left to do is dealing with the ‘keep’ items. You need to do this room by room. Put items in a box that does not belong to that particular room and likewise do for all the rooms. As you are done, empty it out on the floor and sort it out by rooms and then put it where it belongs. This will make you easier to work with. 4th pass: Organizing the Room – This last pass includes organizing the items in a neat n suitable way which you are comfortable with. As you know the set of items belong to a particular room, organize it to its specific area designated to it. This will help in not misplacing the items further. This method is an easy way to declutter fast and is the simplest one to carry out. These three methods are simpler methods to implement while decluttering your home. To each their own. Choose whichever you find it easier to work with and implement. These are the best way to declutter home. It would take hours and days to complete the task of decluttering your whole home with any of these above methods but it is worth the effort when you are done with it. Organizing your Home is not an easy task, here are few easy tips for decluttering and organising your home. So are you ready to challenge your clutter and bring back your home in shape? Image Source: emotion.ngmnexpo.com, christianfemininehomemaking.blogspot.com, dailyherald.com, pinterest.com, thepurplepumpkinblog.co.uk. Next story Trendy Splash Of Colors To Fall In Love….